Hamsters are wily escape artists who can easily extricate themselves from any type of cage that is not securely locked. While the best course of action is to ensure your hamsters are safely and firmly enclosed, there will be times when you are looking for a runaway hamster. Make sure other household pets are locked safely away where they can't hurt the hamster should they reach him first. Also remove any potential hazards that may be in your hamster's path, such as mouse traps or rat poison. While your hamster is out, tread lightly around your home, keep doors and windows closed, and look before you sit on furniture. Hamsters are creatures of habit and may naturally return to the safety, comfort and smell of their home on their own. Prop open your hamster cage door to make it easy for your hamster to return, and stock his feeding dishes with fresh food and water. Periodically check the cage to see if he has returned, and be sure to look under bedding and in tubes, tunnels and plastic houses to make sure he isn’t buried away. Hamsters are nocturnal creatures who are most active during the evening hours, so the best time to lure your hamster back to his cage is at night. Set a trail of food from your hamster’s cage leading outward into the room, the hallway and beyond, and monitor each path. Simultaneously use a flashlight and get down on your hands and knees and look under furniture and along baseboards. Your hamster’s eyes should reflect in the flashlight’s beam, making him easier to spot when he finds his food trail. While your hamster will sleep during the day, most likely curled in a ball in a dark corner or crevice, you can still use food to try and lure him out of hiding and back to his cage. Cover the tip of a dowel rod or mop handle with a bit of peanut butter and wave it around under furniture and other dark, hard-to-reach places. The strong smell and movement can wake your hamster and draw him out into the open and toward his home. Your hamster may be scared, skittish and disoriented even after he makes it back to the vicinity of his cage, which can make it hard for him to find the right entrance. Be prepared by devising a safe way to catch your hamster when you see him. Hamsters, especially Robo hamsters, can be very fast, so have a light hand towel on hand to toss over him and stop his movement without harming him. Gently pick him up in the towel and return him to his cage. Once your hamster is safely back in his cage, securely lock all openings to avoid future escape attempts. You can also work on training your hamster so he can be “called” back to his cage should he get out again. 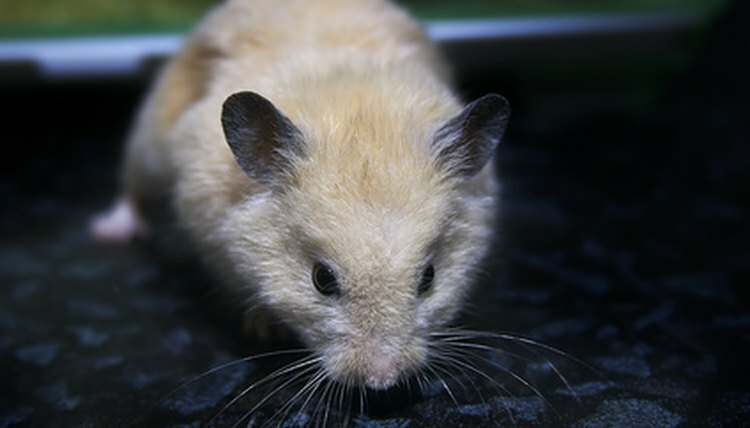 While not as easy to train as dogs, with a little time and patience, some hamsters can be taught to respond to rewards of treats.